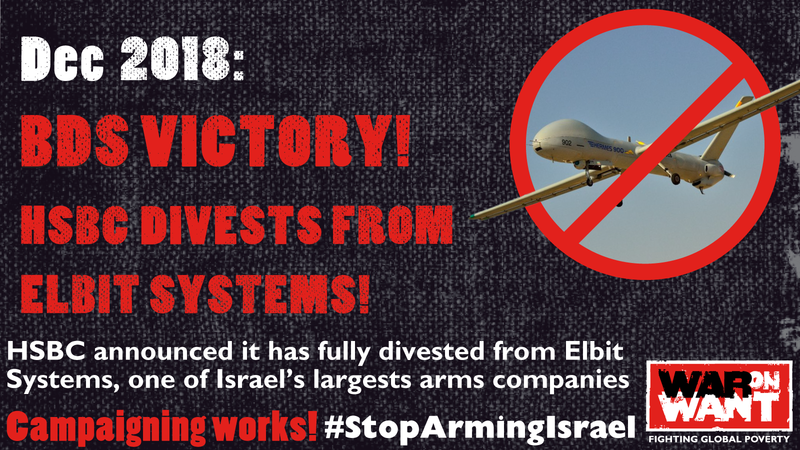 After just over a year of pressure from War on Want and our allies, global banking giant HSBC confirmed to us that it has divested completely from Israeli weapons manufacturer Elbit Systems. From Palestine to the U.S.-Mexico border, Elbit Systems has been a leading force in militarised walls, state surveillance of civilians, and deadly drones. That’s why, as part of our campaign calling on HSBC to Stop Arming Israel, we pressured the bank to divest from Elbit. 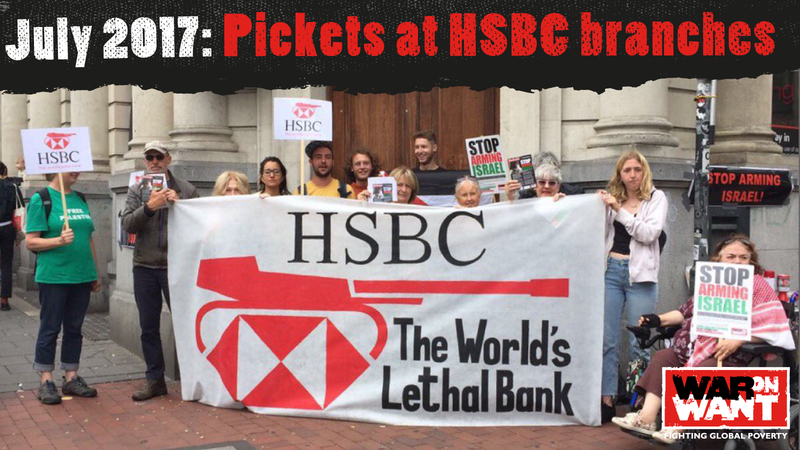 Over 24,000 people took action to press HSBC to divest from Elbit, and the bank finally listened. What a testament to the power of grassroots campaigning! HSBC still has a long way to go before it can claim to be an ‘ethical’ bank. It still maintains business with BAE Systems, complicit in war crimes committed by Israel, Saudi Arabia, Egypt and other repressive regimes, as well as Caterpillar, whose equipment is used in the destruction of Palestinian villages (you can read more about this in our 'Deadly Investments' report). 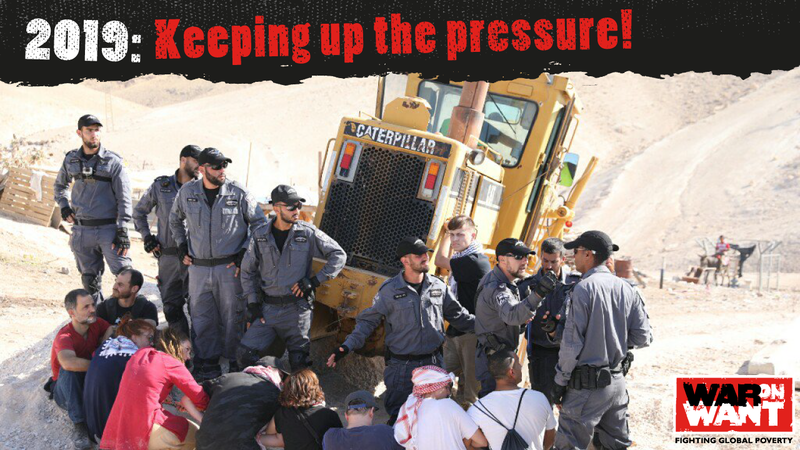 In 2019, we'll be ramping up the pressure on HSBC to end its links with Caterpillar and other companies complicit in human rights abuse. And we'll need your support, now more than ever. Join us! Sign up to become a member or for email updates. 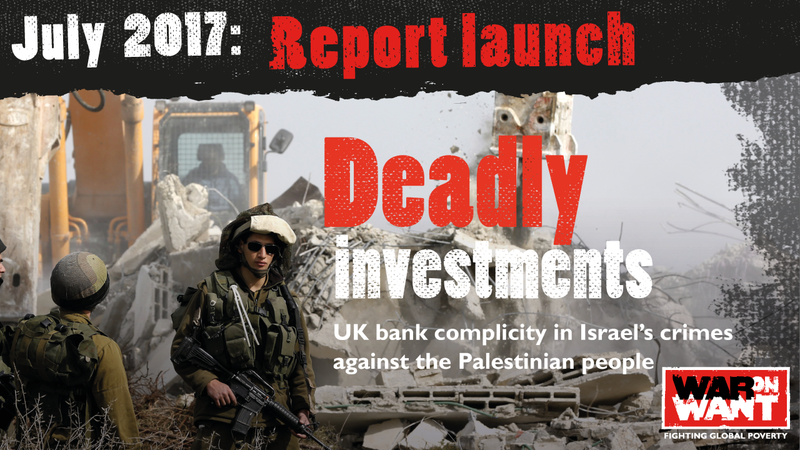 In July 2017, we published our report ‘Deadly Investments: UK bank complicity in Israel’s crimes against the Palestinian people’. In it, we exposed HSBC’s shareholdings in Elbit Systems. We had already communicated with HSBC beforehand to notify the bank of our research and to give it the opportunity to divest and stop lending to companies complicit in human rights abuse. Campaigners across the UK held pickets and protests at HSBC branches calling on the bank to Stop Arming Israel, and thousands of War on Want members and supporters emailed HSBC to get the message across, along with allies from the Palestine Solidarity Campaign and other groups. HSBC called us in for a meeting, and gave us a load of excuses which just didn’t add up. 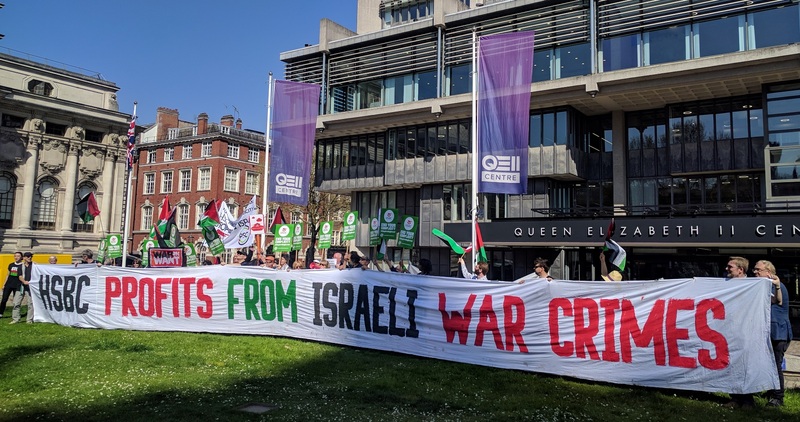 We made clear that doing business with companies like Elbit lends legitimacy to its actions, such as boasting of its ‘combat-proven’ technology, weaponry tried and tested in crimes against Palestinians. 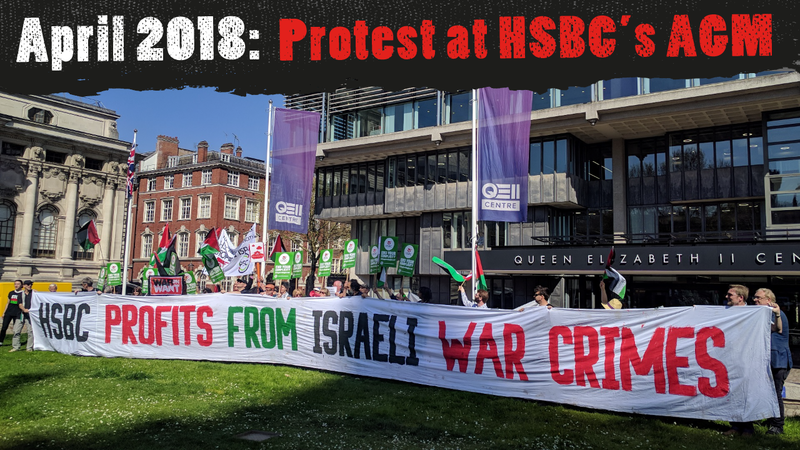 Groups around the UK increased their participation in the popular campaign to get HSBC to stop arming Israel, reaching a high point at the bank’s AGM in April, when we showed up and grilled execs over the bank’s business links with companies arming repression. 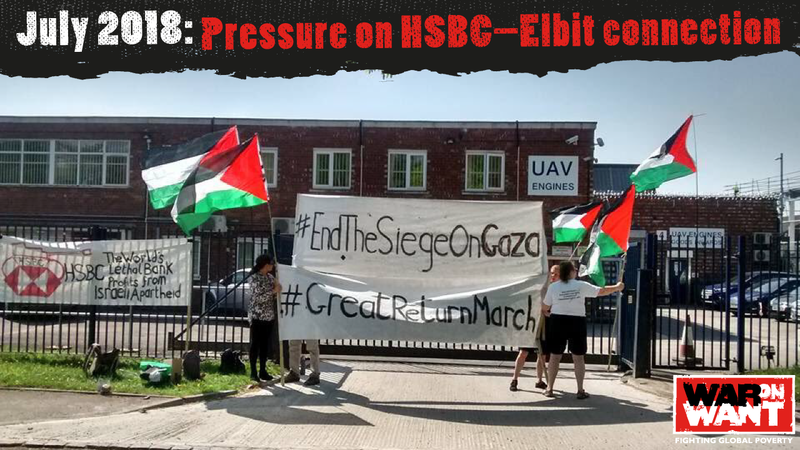 In July, campaigners turned up the heat over HSBC’s connection with Elbit. 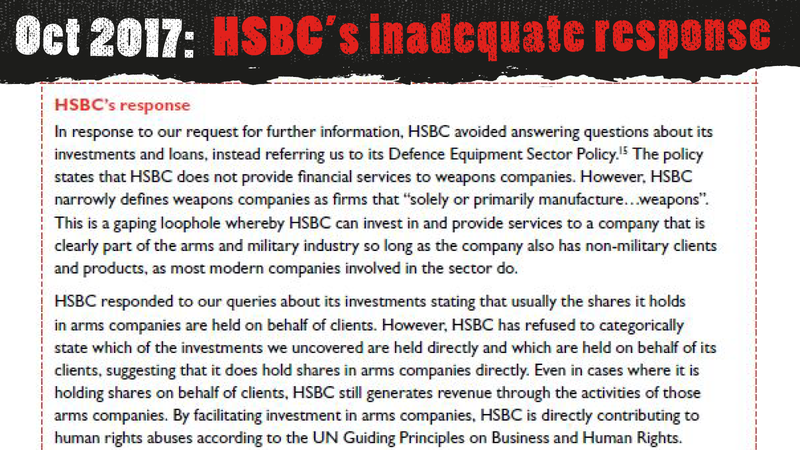 In September, we wrote a letter to HSBC providing more detail on the reason why Elbit has been excluded by banks, investment and pension funds around the world. A national day of action pushed the bank on the issue as well. 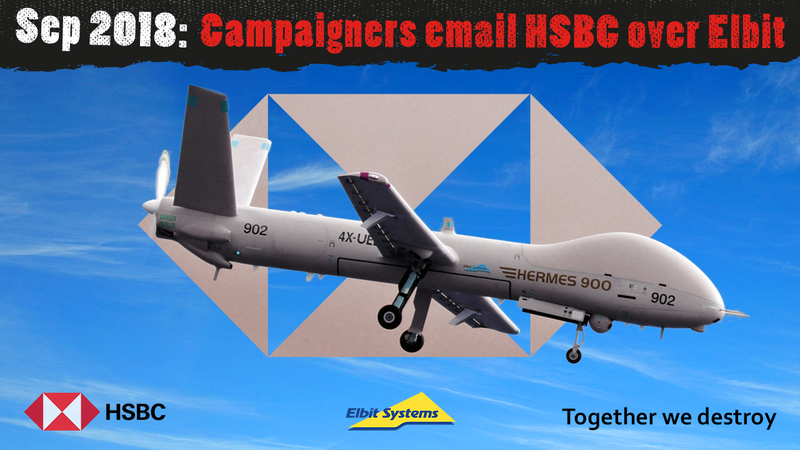 In the last days of December 2018, HSBC emailed us to confirm that the bank had finally completely divested from Elbit, stating "HSBC Asset Management is fully divested from Elbit with effect from close of business, 20 December 2018". In other words, HSBC bowed to our pressure. We won! We'll need even more people to get involved and join the campaign. Sign up to become a member or for email updates.